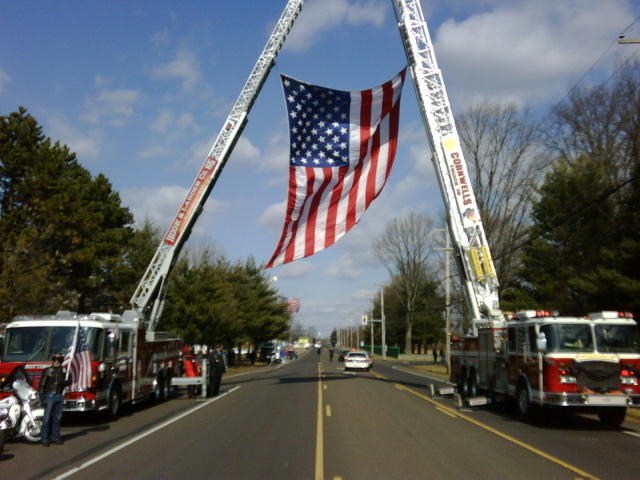 The officers and members of the Nottingham Fire Department send our condolences to thefamily of officer Jones and Middletown Township Police Department. 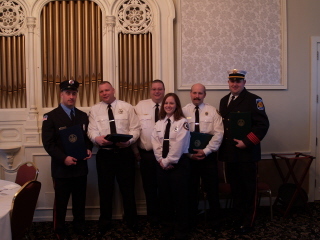 The American Red Cross of Lower Bucks County, Citizens Bank and PECO presented Deputy Chief Robert Sponheimer, FF/PM Thomas Topley of the NFD and 4 paramedics from Bensalem EMS with the 2009 Real Heroes Award. 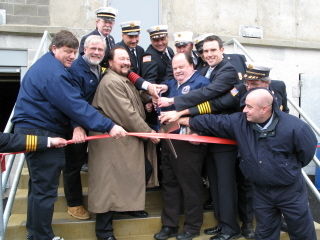 On Thursday March 29, 2008, Sponheimer, Topley (Engine 65) and the paramedics (Medic 186/185) responded to Third Ave. for a report of a drowning in a pool. Deputy Chief Sponheimer arrived on location first and discovered neighbors had pulled a 2-year old boy (who was not breathing and blue) from the pool in the rear of the home, Sponheimer began administering immediate care and decided to pick the child up and run to the front of the home to deliver him to FF/PM Topley and the arriving Medic Units. 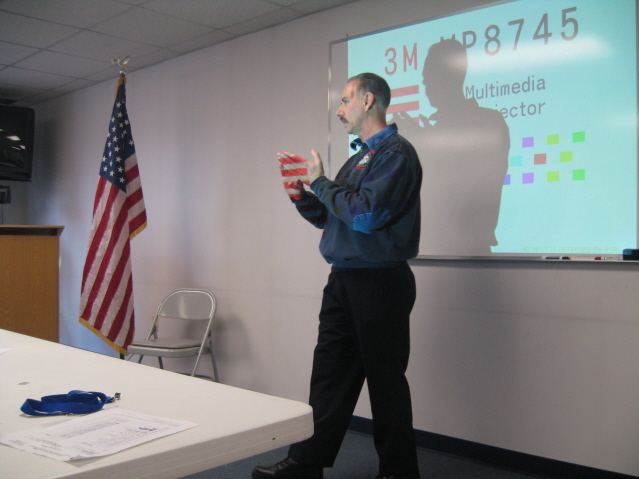 Sponheimer drove the Medic Unit to the hospital as Topley and the other Medic's administering life saving care. The courageous acts of Sponheimer, Topley and the Medic Crews saved the life of young Jude Antoni. Sponheimer, Topley and the Paramedics also received citations from Pennsylvania Senate, Pennsylvania House of Representatives, and Bensalem Township Mayor and Council. The Officers and Members of the NFD would like to congratulate Firefighter Kevin Costello on being hired by Washington DC Fire Department. Good Luck Kevin, make us proud. 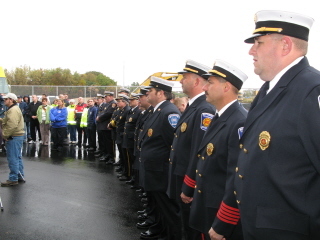 Crews from all of the Bensalem Township Fire Departments along with FM Scanlon and Public Safety Director were on hand May 16, 2009 for the Grand Opening of Firefighters' Filed located at Rockhill Drive and Richlieu Road. 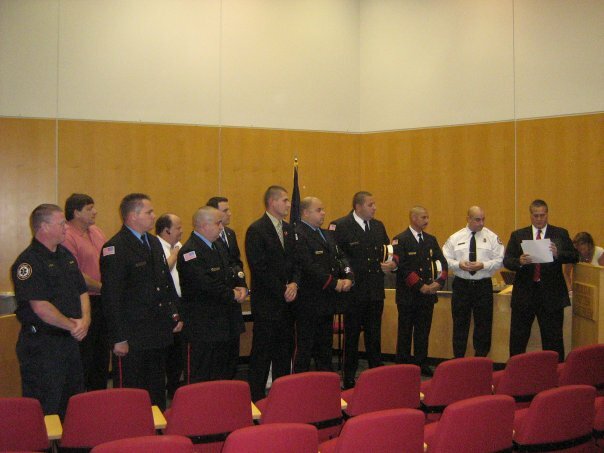 On September 17 2009 members of the Bensalem Township Emergency Services were recognized at an Awards Night. 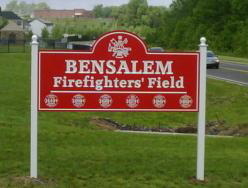 Eight members of the NFD received Official Commendations from Bensalem Township and Citations from Bensalem EMS for their actions on the night of January 18, 2008 at the Philadelphia Park Casino. A vehicle went out of control striking numerous pedestrians in the valet pickup area of the Casino. 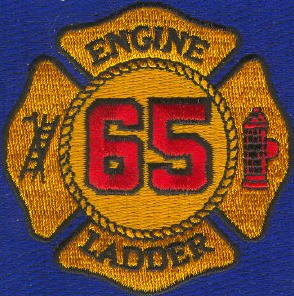 Engine 65 assisted the Medic units with patient care and extricated one patient that was trapped under the vehicle. 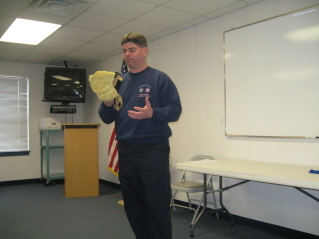 The actions of Chief Ron Harris, Deputy Chief Robert Sponheimer, Lt. Alan Welsh Sr., Lt. David Marshall, FF Fred Sponheimer Jr., FF/EMT Jason Harris, FF/EMT Jim Fox, and FF Mark Pachucki significantly reduced the time it took to mitigate the emergency. 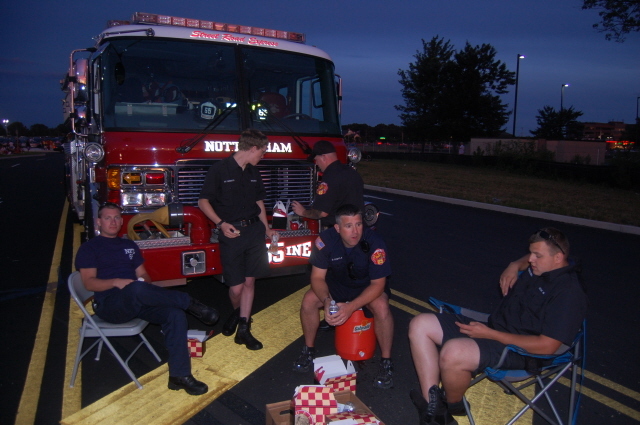 Their actions reflect great credit on themselves and the Nottingham Fire Department. 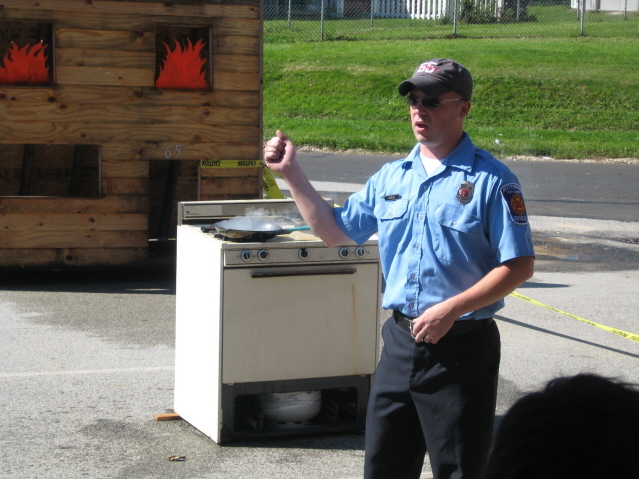 The 2009 Fire Prevention Week concluded with the Annual Nottingham Fire Safety Day (Open House) on Saturday October 10, 2009. 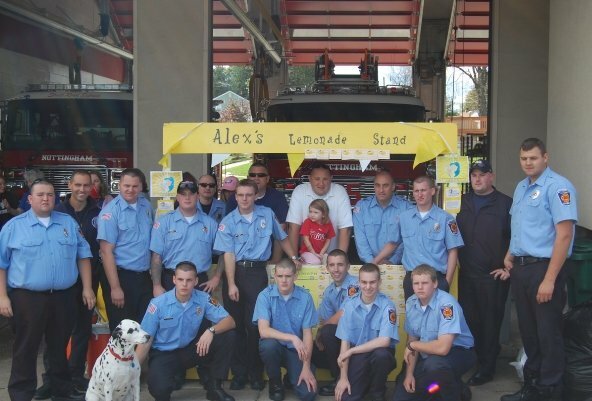 Even though it was a cool cloudy day with some rain showers hundreds of people attended and were given fire safety tips, tours of the firehouse, watched a demo from the Bensalem Township Police K-9 Unit, watched firefighters perfrom an auto rescue demonstration, drank a cup of lemonade from an Alex's Lemonade Stand and much more. 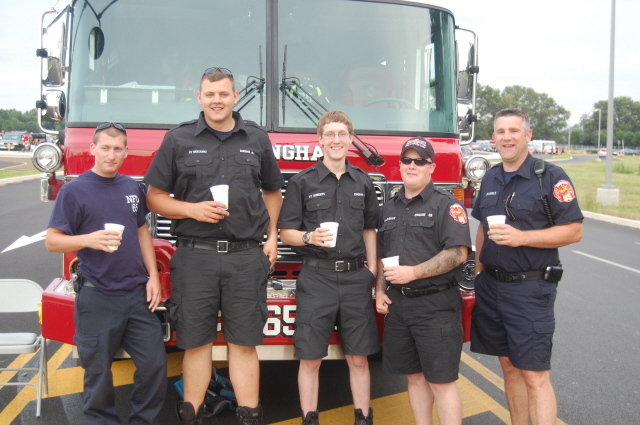 The officers and members of the NFD would like to thank everyone that helped make the day a success. The Officers and Members of the NFD would like to congratulate Firefighter/EMT John Paul Shirley on successfully graduating from his cadet class at the Philadelphia Fire Acadamy. 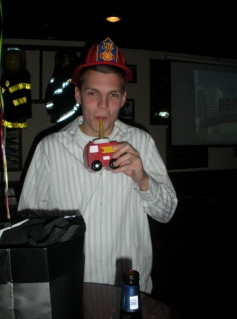 John Paul will now begin his career as a firefighter in the Chester Fire Department. Firefighters from the NFD escorted Santa Claus and Mrs. Claus to the 4th Annual Holiday Treefest at the Bucks County Visitor Center. 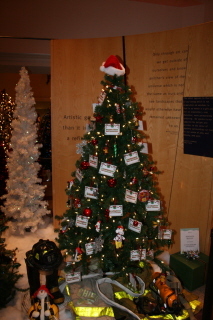 There are 25 themed trees at the Holiday Treefest including one sponsored by the Nottingham Fire Department. This year's theme for the Nottingham's Tree is "Bensalem's Bravest" and the name of each of the departments officers and firefighters appear along with holiday decorations. Stop by the Visitor Center located at 3207 Street Road to check out the display and vote for your favorite tree. 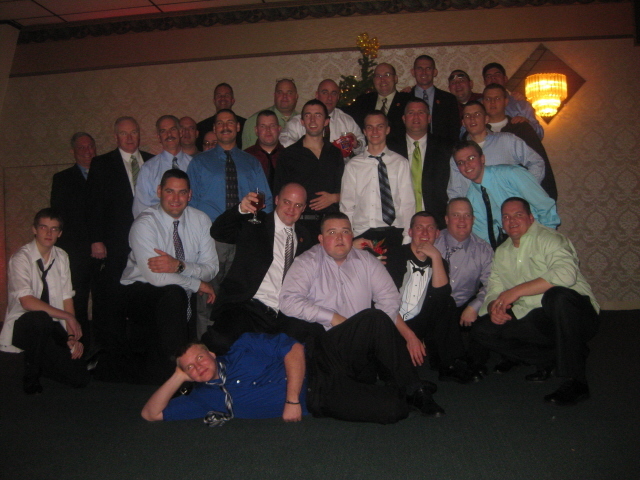 On December 12, 2009 the NFD hosted its Annual Christmas Party. The night was full of good times including FF Kevin Costello (and his girlfriend Stephanie) taking out Chief Harris (and his wife Linda) in the Musical Chairs Contest. FF Mike Sekulski was named the 2009 Firefighter of the Year and FF/EMT John Paul Shirley was awarded the 2009 Chief's Award. On the Administrative side Dave Hunter was honored for being the longest serving President of the Department and George Johnson received the departments highest honor Life Membership.